Omni’s versatile CF series and FS series utility structures are consistently used for such varied applications as storage for hay, sand, salt, cars, boats, aircraft, tractors and machinery. 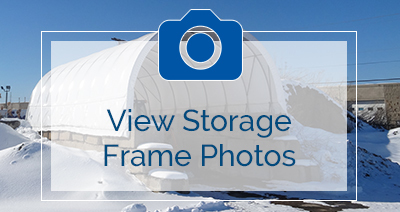 These various structures offer a convenient and economical solution for storage as well as providing a safe, bright, and efficient workplace environment. 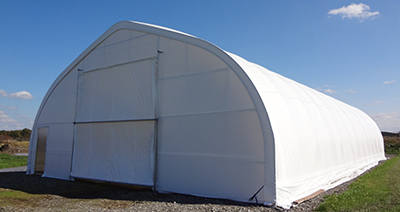 Omni’s utility and storage structures are also an efficient and economical means of increasing your productivity by providing safe shelter from all types of inclement weather. 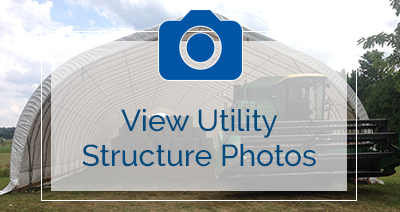 Utility structures provide protection for your valuable hay feed by sheltering it from rot and mildew due to weather exposure. Due to popular demand, Omni has designed a new Freestanding structure to cover all of your storage needs. These fabric clad utility units are designed using our well known Gothic design, which is very effective at snow shedding. Covered in white fabric rather than clear keeps the heat down as well as keeping your storage items such as hay, livestock, machinery or vehicles, out of view. These structures have multiple purposes, and have even been purchased for portable assembly areas or small shops. Using our tried and true reinforced arch system, this structure comes in various widths and in modular lengths up to 144 feet and greater. Omni’s unique roll-up door system is simple to use and offers easy access for large equipment. Below are our package prices for our most popular sizes of this new structure. Each package comes complete with reinforced white poly cover for roof and ends, as well as ratchet straps for tension installation. Endwall framing, one man door and one roll up poly door are also provided, complete with a manual crank opener.